Enter Your Information to Receive the Adoption Certification! Baboochi is a registered trademark of Laura C. Byrnes. The Baboochi story and related artwork are Copyright © 2015 Laura C. Byrnes. All Rights Reserved. Illustrations by Nic Parris. Published by Christina Moss Publishing Burbank, CA. Enjoy $5 shipping on all orders and FREE shipping on orders $49 and over. THE STORY OF BABOOCHI: Once upon a time, there was a planet called Babooch. This is where the Baboochies lived and they were very happy. Baboochi’s are very loving, kind and peaceful. They love to laugh, and play and learn new things. One day the Baboochi’s came to Earth. The Baboochi’s love to learn and have fun, just like the children on Earth do. Baboochi’s need to be adopted into loving homes. So please adopt a Baboochi today, and help them love and learn, with you and your children. CHILDRENS BOOK INCLUDED. 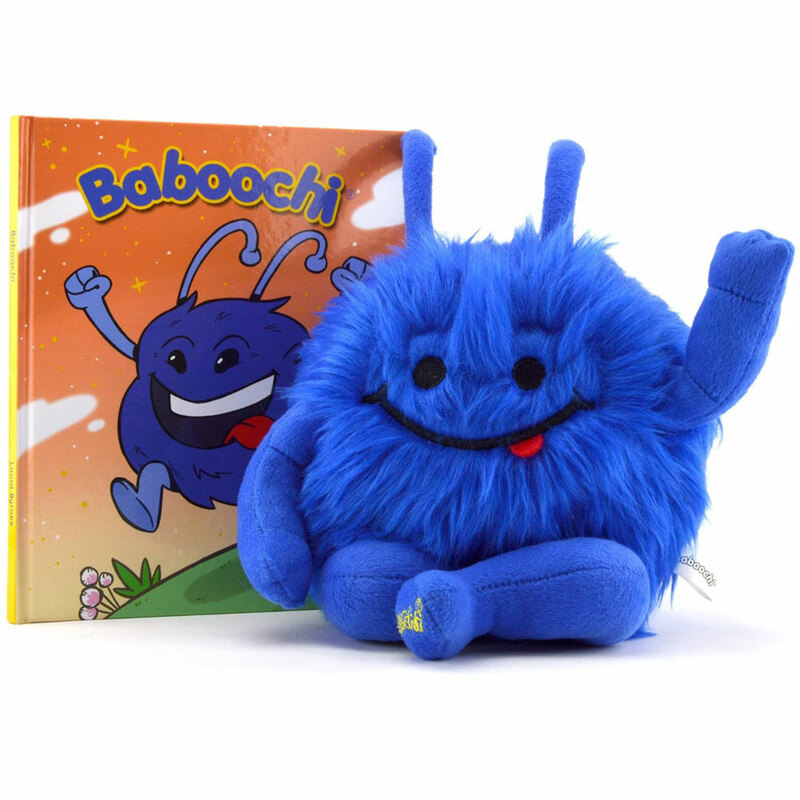 Each plush doll comes with a hard cover children’s storybook, telling the story of Baboochi that you can read to your child (as a bedtime story, before a nap or just during the day). If your child knows how to read, it’s very easy so they can also read it themselves. We have many more books coming too, called The Adventures Of Baboochi. 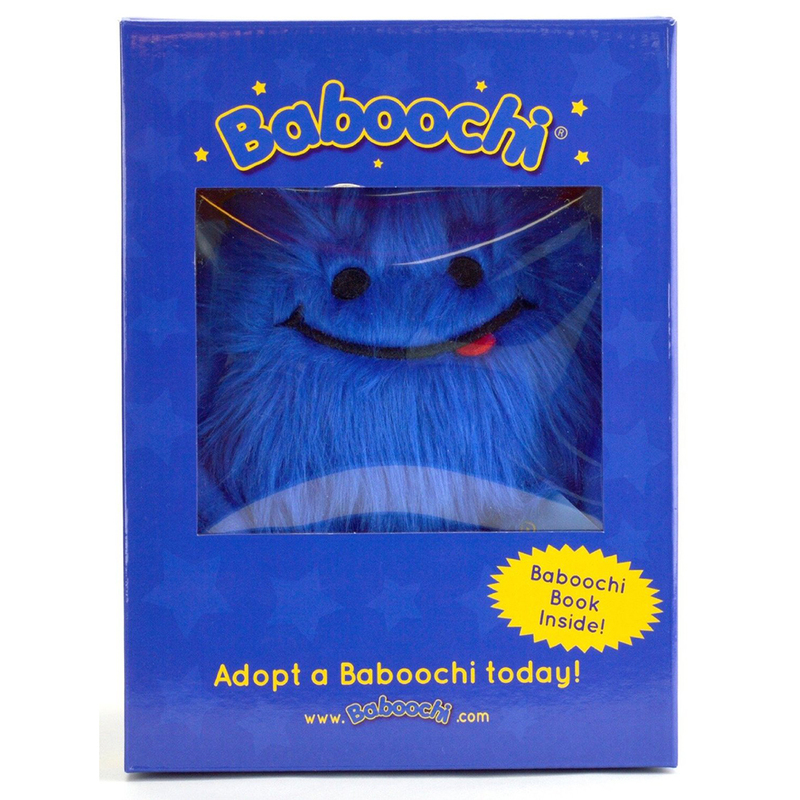 “OFFICIAL” ADOPTION PAPERS INCLUDED: Each Baboochi® comes with “Official” Adoption papers. Instructions on how to get your Adoption Papers are included on the box and in the back of the hard cover Children’s Book that is included with every toy. I bought this as a Hanukkah gift for my 3 month old granddaughter. Her 2 year old and 6 year old enjoyed the story book which their dad read to them while eating their potato latkas. 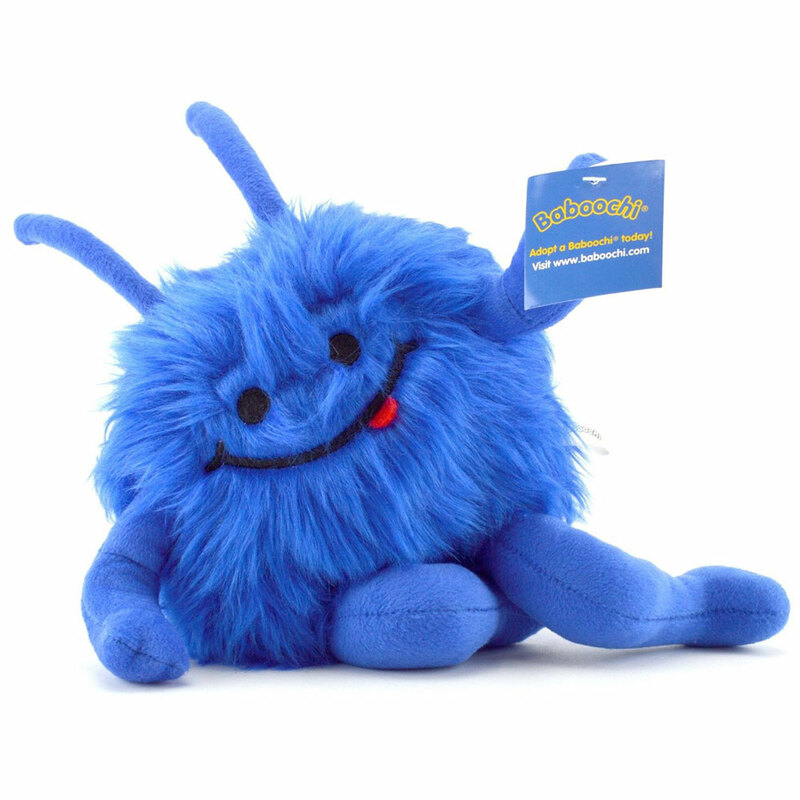 A bendable smiling little blue ball of fluf from outer space! (You can bend his arms & legs) Who wouldn’t love that!? I’m curious to see where the series goes with the books but even without the total interest in the book yet at my kids’ ages, 1 & 3 – they adore their little baboochi guys! They each have one. I feel like once they can grasp the adoption we will go on & get them a bit more involved in the whole process and idea behind it. My nephew loves his Baboochi! He is 18 months old and this little blue guy is perfect for him to hold and carry around. The toy is well made and will last for years. And I noticed that everyone who sees Baboochi breaks into a smile — it is a cute, unique stuffed toy with a delightful name. My nephew’s parents read to him every day and so the lessons set out in the book will be heard many times at his bedtime. Cute creature. I can only hope grandkids will learn manners as they “teach” their Baboochi. Great gift for my 7 year old niece. At first she gave the baboochi toy a funny look, but then she read the story. She is raised to recycle and care about people and the earth so she really loved the story and was very excited to adopt a baboochi and save him. Great toy and book and great value for the price. What a cute story to go with a very cute stuffed animal. I bought one Baboochi and after seeing the story behind them and recognizing the potential for learning for the lucky kids who get them I went back and ordered another one! They are VERY reasonable priced, which is a big plus, too. Especially next year when I buy 3 more for my triplet nieces and nephew. Omg, this thing is ADORABLE!! Giving as a gift- stuffed animal comes in a nice box with a book. 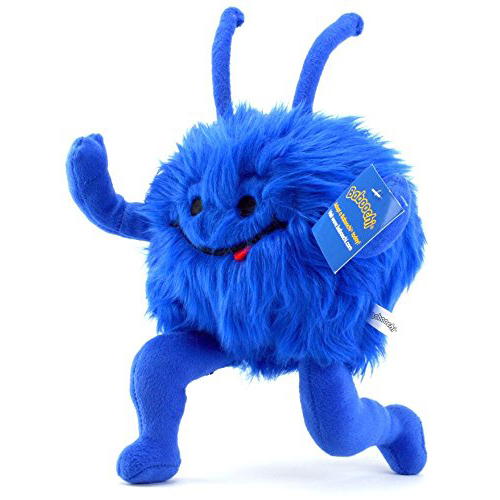 You can move the arms and legs around, its soft and cute and I think any kid would love it!! It’s just too cute!! & it comes with great lessons in the book! I purchased this for my grandaughter for her 5 th birthday coming up in a couple of weeks. I now she will absolutely love this cute cuddly critter. I love the concept of a child learning thru teaching Baboochi and I am sure her parents will love it as well. Anxious for the book series to come out. Thanks so much! I gave this to our granddaughter, and she loved it! Our granddaughter is an avid reader, so reading the story about the Baboochi’s was no problem for her. She would even make up more stories about the Baboochi’s. As a Grandparent is is always such a great blessing when you can activetly explore with them as they use their imagination. Thank you so much for the great Toy. I purchased Baboochi for my three year old niece. It was the first birthday gift she received and she immediately fell in love with it, carrying it around the house with her, talking to it and giving it hugs. Her mother read her the book too, of course, and will re-read per request. All in all, a successful and loved birthday gift. I am a teacher and I bought this for my class. They LOVE it! They actually complete their work so they can ask to get it out and play with it and “read” the book. I’ve read it to the class many times and I love the sweet message about taking care of the planet and being kind to others. We’re very happy with our Baboochi! I read my 3 year the story every couple of nights before bad and she holds Baboochi while I read, playing alone. It’s a great story about taking care of one’s things and the space around them – valuable lessons to be had here. We also discovered that Baboochi is washer safe as my daughter put him in there without our knowledge and Baboochi came out clean and completely in tact. Very happy with our purchase.